English has appeared roughly twice as often as the next most represented language, French (fourteen laureates), which is in turn only slightly greater than two additional European languages: German, with thirteen, and Spanish, with eleven. The list continues with Swedish—and here we might pause to remember that the population of Sweden is just nine million, far less than that of a number of cities worldwide—and six more European languages follow: Italian, Russian, Polish, Norwegian, Danish, and Greek. It is only at this point that Japanese and Chinese finally break in with two laureates each. If these numbers are supposed to be approximations or even representations of an ideal direction, we should ask ourselves if the compass is broken. After all, it seems hard—impossible is probably the more suitable formulation here—to believe that the magnetic north of the literary lies in Europe or in the languages that have emerged from it. Of course, one might wonder if we just need to recalibrate the data to see if the past skews our view of the present. Of course, Kazuo Ishiguro is a worthy laureate. And no matter how much one might debate the choice of the utterly unpredicted and unpredictable Dylan, there is a case to be made—or at the very least a healthy debate to be continued—about what we ought or ought not consider the literary. It’s not the winners, in other words, who deserve our scrutiny as much as the group responsible for selecting them. Specifically, it’s a committee of four to five members, each of whom serves a three-year term and comes from the eighteen-member Swedish Academy, that takes on the bulk of the responsibility. In May, after sorting through nominations that have come in from all over the world, this committee presents its recommendations for five final candidates to the Academy as a whole, which then votes in October after Academy members have read and discussed those finalists during the summer. To be named a laureate, a candidate must receive more than half of the votes cast. 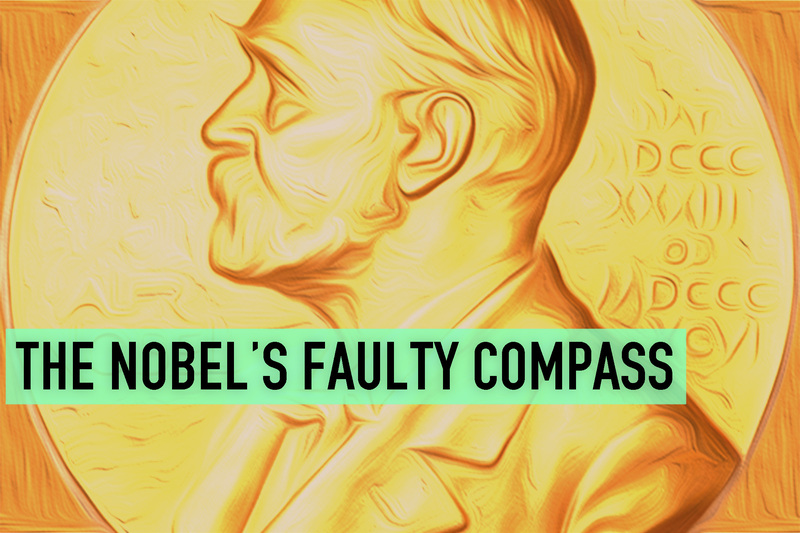 Because records of nominations are sealed for fifty years, speculating about the choices being made is far more difficult than examining how the recipients align with the sole criterion set forth by Nobel himself. Yet what exactly “ideal” means in the context of the will is a delicate matter of translation—even in the original Swedish. A friend of Nobel’s claimed that the inventor of dynamite considered himself an anarchist who would not be dismayed to see any number of social institutions go up in smoke, which would indicate that “ideal” could mean something like “idealistic.” The word that actually appears in the document is idealisk, but those who have examined the handwriting suggest Nobel had originally written another word: idealirad, which does not exist in Swedish but was likely an attempt at idealiserad, which does exist and is usually rendered as “idealized.” All of this led Sture Allén, a former Permanent Secretary of the Swedish Academy, to conclude that, for Nobel, idealisk does not mean “having the quality of the ideal,” which might be as troublingly prescriptive as idealiserad, but rather “referring to an ideal.” What the ideal might be, however, remains unclear. The most obvious benefit of such vagueness is that it allows each generation to define such a fuzzy concept for itself. Although the Academy does not provide any elaboration or clarification, looking at the brief citations that accompany the prize announcement can shed at least a little light on how we might orient ourselves to understand the meaning of “an ideal direction.” These brief texts, which appear in the initial press releases, constitute a first formulation of a justification for conferring the award on a particular writer. The problem is that, Mo Yan aside, any reality that these laureates have depicted is often one that is rooted in elements or ideas that the Academy cannot find all that strange. These writers might provide unexpected interpretations or renderings of the familiar, but they’re not radically unfamiliar. A lack of linguistic diversity, in other words, roughly correlates with the narrow scope of a concept that the committee repeatedly draws on when announcing the award. It’s at that early announcement stage that we as readers might start to register our disagreement with definitions of an ideal through a strategy of complete disengagement. Rather than getting consumed with the inevitable controversy over a given year’s selection, we should indicate that we will no longer give it so much weight. Let’s take the resources devoted to breathless anticipation, ridiculous betting, or temporary sales bumps and instead devote them to encouraging a more widespread, active, and consistent participation in the literary sphere that leaves little room for the Nobel to wield so much cultural weight. It could continue to acknowledge what an engaged public already supports—as with the recent awards for long-popular figures like Munro, Dylan, and Ishiguro—while we instead recognize our collective ability to define an ideal direction that is far more diverse and far more encompassing. Sam Carter is an Assistant Managing Editor at Asymptote.